facility that offers comparable service is over 600 miles away. 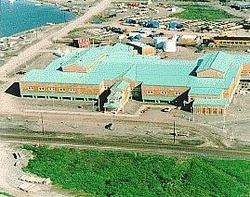 The $42 million Maniilaq Health Center was constructed in 1995. At over 88,000 square feet, it is over twice the size of the old facility. The Health Center houses an emergency room, with local and Medivac support for accident/trauma victims, as well as an Ambulatory Care clinic, Dental and Eye Care Clinics, a Pharmacy, a Specialty Clinic, and an Inpatient wing with 24 beds for recovering patients.